What kind of handbags may I hang on the Lady’s Hand hanger? Up to 6" Holds the bare minimum - your phone, keys, lip gloss and a few credit cards. 6 ¼" to 12" Fits a small wallet, phone and lip gloss. 12 ¼" to 14" Holds all the essentials, with room for your back-up flats. 14 ¼" to 16" Carries essentials, work papers, laptop, water bottle, and back-up shoes. Larger than 16 ¼" Holds essentials plus a magazine, laptop, a light scarf and anything else you need. Does Lady’s Hand hanger work on both double handle and single strap bags? Yes, it works on both. Where may I use the Lady’s Hand handbag hanger? May I use Lady’s Hand for a table handbag hanger? No, you may not. The hanging hook-shaped element of the Lady’s Hand hanger is designed especially for wardrobe rails. 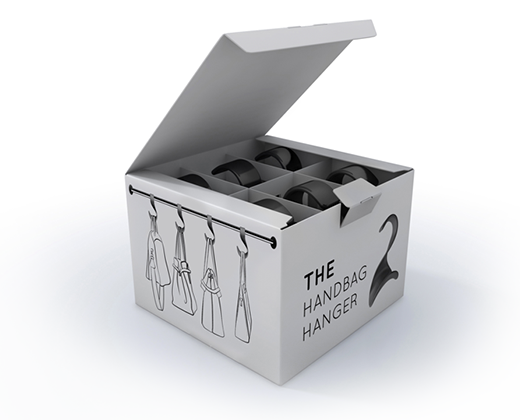 The hanger is made of plastic (ABS) and if the table’s surface is flat and slippery, there might be lack of cohesion between the hanger and the table’s surface, thus the hanger may slip and the handbag may fall on the ground. How many handbags may I hand on the Lady’s Hand hanger? The bearing part of Lady’s Hand hanger is designed to bear a sole handbag only. This is the only way to keep the handbag in best condition possible, as far as its handles are not taking awry shape or its body is not getting damaged by the pressure of another bag. The best way to preserve a handbag is to store a single handbag hanging on the Lady’s Hand hanger in a vertical position, as if being held by a woman’s hand. May I hang a full handbag on the hanger? We recommend hanging an empty handbag on Lady’s Hand handbag hanger. The maximum weight that the hanger can bear is limited to 5kg (11 lbs). Another reason is that hanging a full handbag may damage its handles due to the tension of the handles. What is the difference between Lady’s Hand hanger and the other handbag hangers? - Storing handbags in a position that differs from the only appropriate vertical hanging position. - where to put their handbags if their closet is smaller sized. The familiar handbag hangers usually solve only one of the problems at a time. The most important advantage of Lady’s Hand hanger is that our innovative product is designed to solve each one of the problems stated above simultaneously. What is the minimal quantity that I may order? There is only one type of packaging that includes six pieces of handbag hangers in a box. Up to date, Lady’s Hand Hanger is produced in a sole black colour. Each pack of six hangers consists of six pieces in a sole color, i.e. six pieces in black or six pieces in white. Unfortunately, you may not. We are working on improving our services and offering the best options to our customers, but currently we’re offering the package of six only in a sole color. Of course, you may always combine with a friend by ordering different colors and the change pieces to make an affordable color mix for each one of you. Are there any different shapes or sizes of the Lady’s Hand hanger? No. We offer Lady’s Hand hanger in one size and shape only. Where is the Lady’s Hand hanger produced? The Lady’s Hand hanger is being produced in the European Union and it meets the highest quality standards for a high quality home design product related to the material and the manufacturing of the product. The product is protected by the International Intellectual Property legislation provisions and being protected as a subject of industrial property rights in all major markets. The original Lady’s Hand handbag hangers are produced solely by Lady’s Hand Ltd, situated in Bulgaria, Europe. Any product originating from a legal entity or a natural person, different from the stated above may be a subject of intellectual property rights infringement. As such they shall commence an investigation of meeting the requirements of taking legal action if it deems necessary to maintain Lady’s Hand Ltd’s intellectual property rights protection. Is Lady’s Hand handbag hanger safe to use? Lady’s Hand hanger is completely safe to use. It is produced from highest quality Acrylonitrile butadiene styrene (ABS). It is commonly used in household consumer goods manufacturing, including toys (e.g., LEGO bricks, dishes (SAN), small appliances, musical instruments as recorders, clarinets, piano movement parts, golf head clubs, office equipment, etc.). ABS is a recyclable plastic material. The shipping date depends on the shipping company and shipping policy chosen. How much does one hanger weigh? Where does the name of Lady’s Hand hanger come from? The name of the Lady’s Hand hanger originates from the lady’s hand which inspired the design of the product’s shape. We're flattered you asked. :) Learn more about us here.